What was your first brush or brushes and do you still have or use the brush or brushes? In high school (New York), I worked 2 evenings a week delivering for a Fuller Brush salesman, so my first brush was a Fuller brush Boar which cost me $1.25. 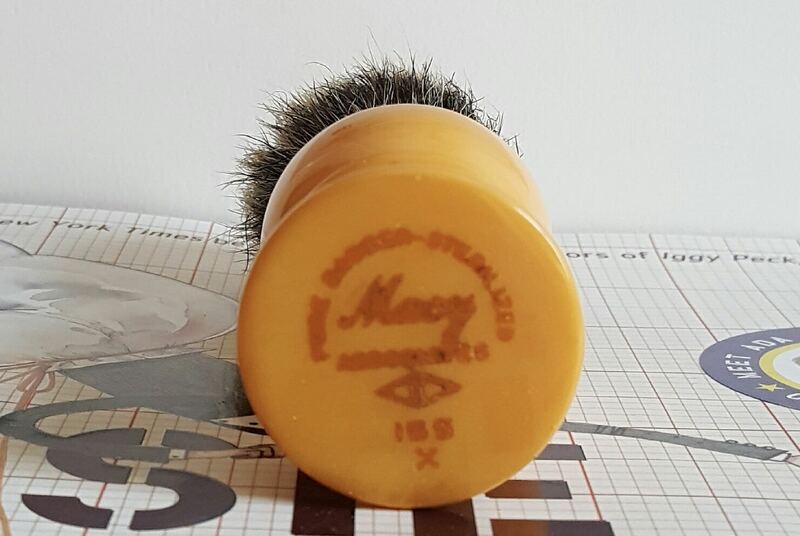 I do not' have that brush any longer but I do have my first badger from Macy's that was around 1964 and a few others a Simpson 1970's and a GEO. F Trumpers 1990's. Those old butterscotchs are beauty. My first brush was a cheap Frank Shaving product, which began to fall apart right after I got it. Subsequently, when this pastime became much more deranged for me, I meandered through vintage Plissons, vintage Somerset Simpsons, Shavemacs, Paladins, and Rooney Finests. I still have my first one, a piggy that I can’t remember the name of, bought with Some tabac in ‘70. A wonder it has not disintegrated, travelled to many a country (I was in the military) in my backpack. Thankfully no, I no longer have that piece of crap boar. The handle was even so junky as to not be worth reknotting. That said it did offer me a window into the joy of brush and soap, just not sentimental enough to keep it around. No, I don't. Back in "the day" every soldier had to have a brush, puck or tube of shaving cream. You could use can shaving cream, but you Had to have the other. another shave brush for your weapons, used that one, a lot. But I don't have any of those now. 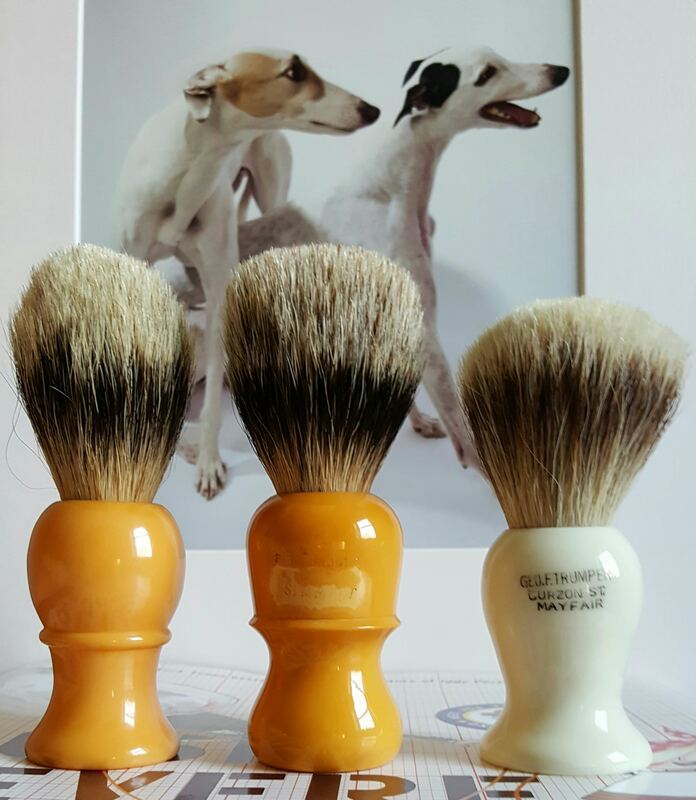 My first brush was an Art of Shaving small pure badger travel brush that came in a medium sized travel kit. Ultimately I found it to be too small, too floppy and too much scritch. As a result it is packed away in a bin with a bunch of other shaving gear that doesn’t get used. My first was a Semogue 1305. A fine brush for the price. I remember using it to try to lather a sample of Mitchell's Woolfat from Gary's sample shop (anyone remember that?). That was a bad experience but had success with other soaps. It ended up sitting for a long period of time when I got in to badger, and when I tried to use it again it became a shedder. Too bad, it had some sentimental value. I do. I commandeered it from either my brother or my dad, I can’t remember exactly who, I just remember it wasn’t mine, and it was never used, so I started using it. I didn’t know there were different soaps for using a brush versus canned varieties, so I used it with whatever I was using or Edge goo lol. I didn’t use it every time, only when I wanted a nicer shave than normal. I started using Keihl’s (something Eagle in a blue tube) in my early 20’s trying to find a better way, and even tried to use the brush with that lololol. That was definitely worse than the goo with a brush. But yes, I still have it. The knot fell out at some point so I reglued it back in. I have no idea what brand it is, but I think it *may* have come with a frag set that came with shaving cream and aftershave. What I do know is it looks the same shape as VdH, but it’s a dark turquoise color, and it had a round silver sticker on the bottom that indicated it was Badger. I do not. My first brush was a vulfix 2234 and it felt a bit like a wet mop on my face. I sold it within a month. I don't have mine, but it was an Omega 10066. No, I do not. It was a cheap drug store boar brush. But, it worked just fine? A Burma Shave Brush If memory serves me right? 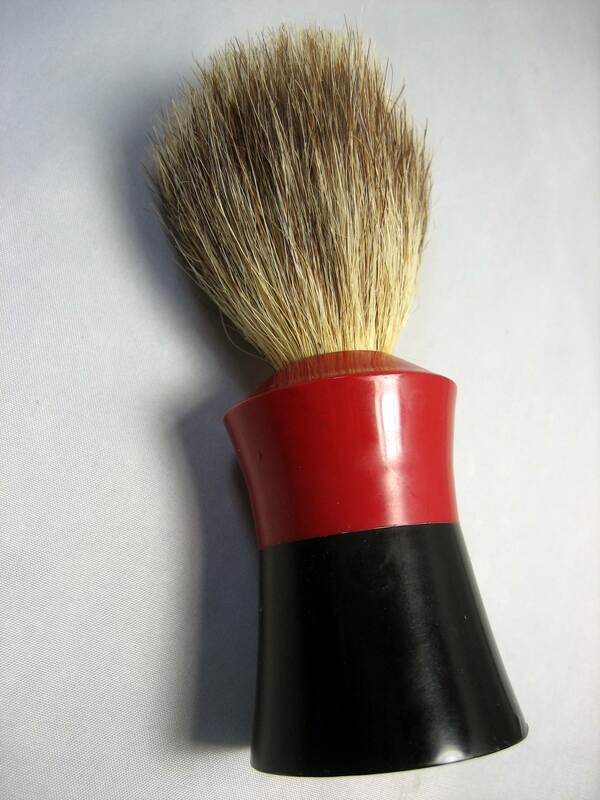 My first shaving brush was a badger brush bought in 1996, and I knew exactly ZERO about badger brushes back then. It was a Pils 3-band silvertip in 24 mm and it actually was pretty nice, solid backbone and soft tips. But vastly overpriced. I bought it in a set along with a Pils Sensor excel razor and a Pils stand. Normal price for this set was something like $350 back in 1996 and I bought it on sale at 50% off. I never really learned how to make lather properly with the brush, since I didn't know who to ask for advice. Got rid of the Pils set in 2006-2007, without knowing what brand Pils really was. The first brush I bought after really getting into wetshaving and reading the forums was a Mühle 3-band Silvertip 24mm. It was actually pretty good, a bit flopy, but a pretty solid rookie/starter brush. I have sold this brush a long time ago, probably back in 2012. I don't have my first brush, but it was an EJ BBB. It was enough to know I wanted to go down this path. I have as of late bought and traded for some brushes I used to own, so that counts, right? I don’t have my first brush - as it was a very inexpensive badger. I went forward and (thankfully) bought some better products. I still have mine, a Muhle in black pure. I bought it at a local shop that was closing up in 2009. It is a high lofted prickly fun to use brush. I love it whipping up cream with it, different for sure. A metal handle that I would love to stick a three band in. I wonder if it is doable. Yes sir! My first is a Omega boar 10083. Still use it to this day. Best $9 I ever spent on shave gear! My first brush was a Semogue 3-Band, but I quickly sold it as it lacked sufficient backbone once I bought my first Semogue boar brush. I have no regrets with letting it go. From a family of savers, I have a plastic handled Every Ready from back when. Thing is I have no idea how old it is, nor of what the very tiny knot may be. It is a small, floppy thing that I've held onto ..